Jumia is on a search for a winner on the first ever edition of the Mr and Miss Jumia Uni Competition it is on. 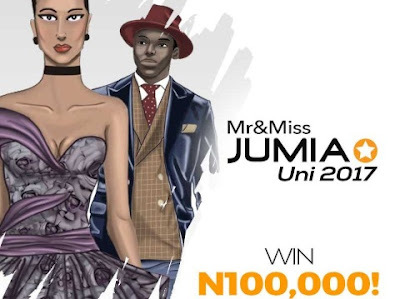 The maiden edition of the Miss & Mr Jumia Uni Instagram competition has kicked off! And there are loads of exciting prices to be won! Simply nominate yourself or your friends by tagging them in the competition on our @jumiafashion page on Instagram and using the hashtag #MrJumaiUni2017 or #MissJumiaUni2017 in a very photogenic photo of yourself. One winner will be selected each in the Miss Jumia Uni 2017 Category and the Mr Jumia Uni Category. Endowment for winner’s school department Finalists will be picked by Jumia and announced on Friday the 8th Of September 2017. Start your entries now! The competition is on INSTAGRAM ONLY!